RandomPottins: Is Brent roadblock on the Palestine 'Road Map'? Is Brent roadblock on the Palestine 'Road Map'? IS the London Borough of Brent, proud of its multi-cultural harmony, destined to contribute a block on the Middle East's path to peace? Israeli prime minister Ehud Olmert and Palestinian president Mahmoud Abbas have agreed to meet in a week's time at Annapolis, in Maryland, and say they will negotiate "immediately and continuously" to reach a final peace. Arab states will also be represented. One still hears talk of the Western government's "road map" (for instance from the British TUC), even though there is little left of the Palestine promised in the Oslo talks, and Gaza remains like a giant prison, under siege. Meanwhile a host of Israeli and Arab intellectuals are talking at London's School of Oriental and Arab Studies(SOAS) this weekend for a conference entitled "Challenging the Boundaries: A Single State in Palestine/Israel". Most seem to have found niches in academic life here, and who can blame them? But maybe it would have been more realistic to phrase that "A single state in Palestine - Israel". Because the prospects for a Palestinian state of any kind right now are looking very grim and limited. Anyone who wants to put a brave face on it, saying "good, we never liked the 'two-state solution' anyway" could find themselves in a position reminiscent of German communists in 1933 saying "well, that's bourgeois democracy out of the way", or as some did "after Hitler our turn", only to find themselves on the same trains with the social democrats with whom they'd had such differences. . The Israeli Labour Party and Zionist "doves" used to talk about "land for peace", but what we have seen continuing, whatever talks were held, is land for settlements. And that is where the London borough of Brent, though better known for housing refugees than embassies, has been given its surprising role, even if its a bit part. I've talked about the Israeli property companies on show at Wembley last week, but I'll let the Guardian take up the story. Israeli companies are using UK property shows to sell housing in illegal Jewish settlements in the occupied West Bank, Guardian Unlimited can reveal. 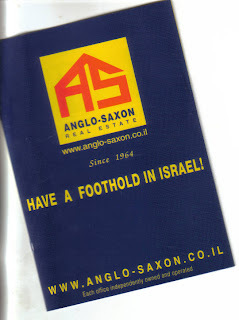 At the Israel Property Exhibition at Brent town hall, North London last Sunday, one company, Anglo-Saxon Real Estate, was offering for sale properties in Maale Adumim and Maccabim. Both West Bank settlements lie on the Palestinian side of the so-called green line, the pre-1967 boundary and often cited as the border between Israel and a future Palestinian state. The Israeli prime minister, Ehud Olmert, and his Palestinian counterpart, Mahmoud Abbas, are expected to meet before the end of the year in Annapolis, in the US, for peace talks that have the backing of the UK government. Abbas has demanded the Israelis halt all settlement activity and that the whole West Bank be included in a future Palestinian state. Kim Howells, the British minister for foreign and commonwealth affairs, has described settlement activity as an "obstacle to peace". The Anglo-Saxon real estate website was today listing 67 new build residential properties in Maale Adumim and six in Maccabim. That they are new properties is particularly significant because it indicates buyers would be contributing to expansion of the settlements. Maale Adumim forms part of the Israelis' controversial E1 plan, which would see the building of thousands of housing units as well as industrial and tourism zones to connect the settlement with Jerusalem. The result would be to divide the West Bank, making travel between north and south more onerous and isolating east Jerusalem, according to critics. Maale Adumim has around 30,000 residents and is already one of the largest settlements in the West Bank. Israel wants to retain it in any future peace agreement. In answer to a parliamentary question in June, Howells said: "The UK consistently makes clear its view that settlements are illegal under international law and that settlement activity is an obstacle to peace." He added: "We are concerned by reports of Israeli construction work at El. The continuing process of establishing settlements is encircling east Jerusalem and breaking up Palestinian territorial contiguity throughout the West Bank. "These practices fuel Palestinian anger, threaten to cut east Jerusalem off from the West Bank and undermine the prospect for a viable Palestinian state." Gavin Gross, director of public affairs at the Zionist Federation, which organised the Brent fair, said: "While the promotion or sale of houses beyond Israel's green line is a contentious subject for some, it is not prohibited in Britain." Having done my best to stir some concern over the Wembley town hall exhibition - which Brent Labour Party member Dan Judelson also took up with local councillors - I thought I'd better get along to join the protesters outside. I'd been to see the films 'Bayit'(House) and 'The Iron Wall' that morning, which delayed my arrival but strengthened my resolve. There was a handful of people from Jews for Boycotting Israeli Goods (J-BIG), and a few Palestinian Solidarity activists. Local people passing by were interested and mostly supportive, though also surprised - startled to learn that their town hall was being put to such controversial use, delighted to hear that Jewish people were opposing it. From the exhibition itself some Israel supporters came over the road to argue or abuse the demonstrators. One young man told us we could not be Jews, then searching hard in his imagination for terms of abuse, accused the women of being "Muslims! ", and then as his parting shot, "Gypsies!" If he had not had such a dark complexion I'd have placed him as BNP. It must be hard not being eligible for the party that reflects your outlook best. An Israeli woman told one of the Jewish women demonstrators "I hope your son gets killed". Gents in suits accused us of supporting "terrorists", and repeatedly told us there was "No such people as Palestinians", (only terrorists, you see) and "No such country as Palestine" (an attitude that seems official so far as some internet media are concerned, I notice). Obviously if there is no such country then the property companies were, as we were assured, only advertising properties "in Israel". And if there's no such place as Palestine, who needs "two states" (unless the second one will be called 'Yesha', or 'Judea and Samaria' )? Never mind Return, what they are planning is "Transfer". So if people like those meeting at SOAS are still worried about the "two states" compromise I can reassure them - that's the least thing they need worry about. It's a pity more people could not have made it to the Brent town hall protest. It wouldn't have made much difference to the exhibition punters but you could have gained an education listening to them. OK, some people will tell me these racists and ignoramii full of hatred and contempt for another people are not authentic or typical Zionists. They are certainly not speaking for all Israelis. But if you look at what is happening on the ground, and what is being done to the Palestinians, who is to say theirs isn't the real voice? Peace? Transactions speak louder than words. Hi Charlie, did you manage to get yourself along to this conference, and if so, will you be blogging about it? Assume you mean the SOAS conference as the Annapolis summit has not taken place yet and I don't think I'm invited. No, though not wishing to knock the people involved, whose work I have found useful, I feel the one state/two state argument is a bit abstract and utopian - not in the sense that one state would be impossible - it is plainly better and more practical a way of running the country than any other arrangement; but that it is posed quite distinct and separate from any struggle happening now, and we are not told by whom or how it can be realised. In my view there is a grave danger that what sounds like a super-duper left-wing slogan can mean abandoing the struggle against occupation and settlements, and become a sort of daydreaming while Israel goes ahead with expansion and "transfer". I've been to a talk at SOAS by Nuri al-Okbi, leader of Negev bedouin, and barely ten people attended what was a rare opportunity to hear someone involved in struggle. The bearded ones were there to suggest Bedouin ought to make martyrs of themselves in battle rather than engage in grass roots campaigning and testing Israel's "democracy" and laws. Then I attended a two-day economic conference where lots of people came, and some claimed that Palestinians within the Israeli state were doing nothing. It was a very educative conference though. I don't think I'd have had the patience for the one-state do, and if I felt like walking out that would have been £20-30 down the drain. I will be at the House of Commons next week for the Palestine lobby (Wednesday April 28).